As we saw in today’s first post, the Cubs offense is still one of the best in baseball. They get on base, they hit for power, and they score a lot of runs. It’s a familiar cast of characters, with Addison Russell the notable absence, serving his suspension to start the year. The Cubs infield is no doubt one of the best in all of baseball. 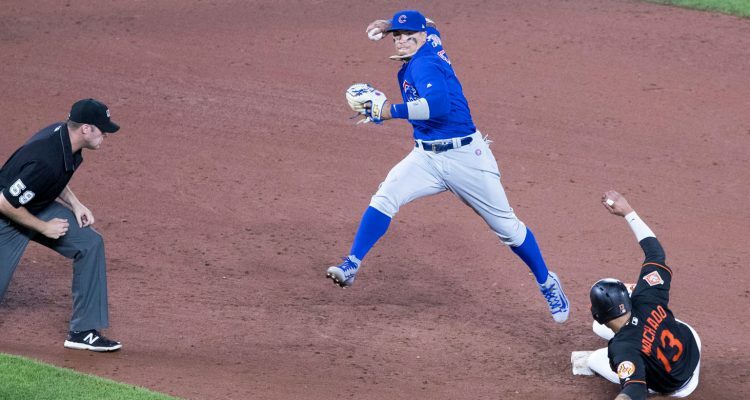 If Kris Bryant comes back fully healthy and Javier Baez finds a way to repeat his 2018 performance, that makes three potential MVP candidates (including Rizzo) from just the infield alone. While it is unlikely that they all have career years at the same time, the projections are very favorable for all three (3rd, 6th and 8th in the NL Central for projected OPS). Factoring in the defensive versatility, a host of bench bats that will get their share of playing time in Happ, Bote and Descalso, and an experienced veteran in Zobrist, the Cubs infield is any manager’s dream unit. 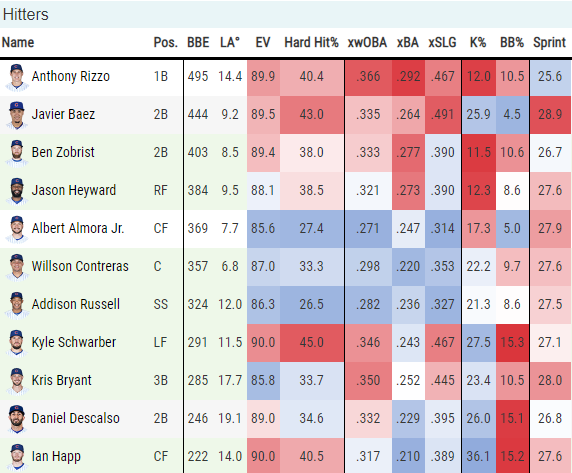 The outfield is not as strong but certainly holds their own, comprising of big-time slugger Kyle Schwarber, defensive guru Albert Almora Jr., and a past-his-prime but still valuable Jason Heyward. 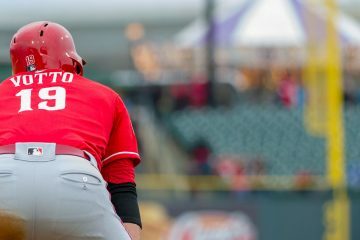 Schwarber certainly has the most offensive potential of the group, and the former Indiana Hoosier will look to build off of his rebound performance from 2018. The projections are rather bullish on him, so it is possible he returns to form of his rookie season when he became a fan favorite in Chicago. Behind the dish, Wilson Contreras looks to rebound from an abnormal down year at the plate. 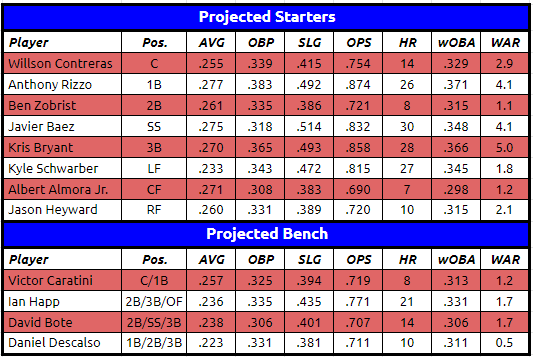 His strong defense drives his projected value up even if his bat does not fully recover. Victor Caratini is a solid backup option off the bench. A casual baseball fan scrolling through starting rotations could very well come across the Cubs and think they have a top staff in all the majors. It will be very interesting to see how well this group plays in 2019, given that neither age nor injury history are on their side. Yu Darvish’s return from an injury shortened campaign that started out poorly even when he was “healthy” will be a critical piece to Chicago’s pitching puzzle. Projections do not see an ace-like performance that we were accustomed to from Yu in Texas, but at this point I am sure Cubs fans would gladly take a full year of 3.76 ERA. With five more years on his 6 year, $126MM contract, durability would be a step in the right direction. Jon Lester, once a dominant force and anchor to this staff, showed continued declines to his peripheral numbers last year. He projects as the weak-link for the rotation in 2019, though still capable of keeping his ERA below 4.00. Fellow 35-year old Cole Hamels is not expected to recreate his 2nd half success from last year but should remain dependable barring injury. 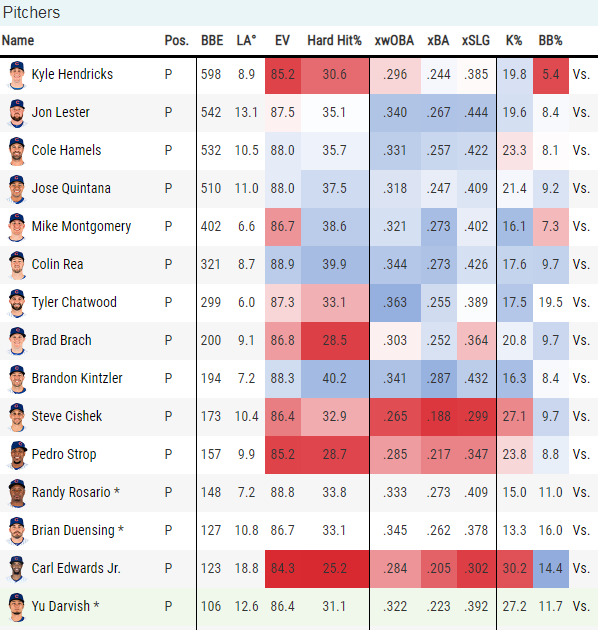 Hamels’ projections are not great, but he has potential to outperform and could be a an x-factor for the Cubs pitching staff. Jose Quintana’s ZiPS projections are favorable, but he did take a big step backwards in 2018 and posted some of the worst numbers of his career. He threw a lot more fastballs and was not as effective with his breaking pitches, a bad combination that led to a career high 1.29 HR/9. 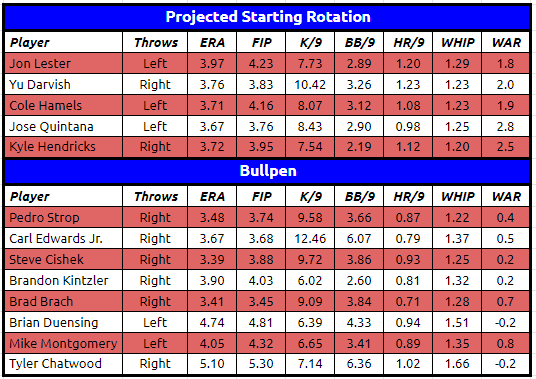 ZiPS is expecting that to normalize, but Quintana could be in trouble if he cannot improve his curveball. In his age-30 season, he will look to channel his days from the South side and bring those results North to Wrigleyville. That leaves Kyle Hendricks, the safe bet as the top hurler for the club. Hendricks has been pitching well for years, thanks in part to a very strong changeup that he threw over 30% of the time in 2018. His second half last season was very strong and Chicago will hope he can build on that success. Offseason acquisition Brad Brach has potential to be one of the Cubs strongest bullpen arms. Pedro Strop (if healthy) and Carl Edwards Jr. should once again deliver strong performances. Brian Duensing has work to do after a poor 2018. Tyler Chatwood and Mike Montgomery, who both started around 20 games last year, will move to the bullpen with the return of Yu Darvish. The Cubs bullpen is currently in rough shape from top to bottom. Brandon Morrow is recovering from elbow surgery that took place last November. His targetted return to the team is by May, but the team will be without it’s closer until then. That was supposed to give way to Pedro Strop to fill in, but he is now dealing with a right hamstring injury. Xavier Cedeno and Tony Barnette, two low-key offseason additions, are also battling arm/hand injuries. Cubs President Theo Epstein has said that the team does not expect to add any outside arms (i.e. Craig Kimbrell) to bolster the pen. Newly acquired bench-bat Daniel Descalso has a shoulder injury with no current timetable to return. He was brought in to fill Tommy La Stella’s utility role, which is a more pressing need given Addison Russell’s 29-game suspension to start the year. If Descalso misses time, it should lead to more looks for David Bote, who played well in his first taste of the show last season. FanGraphs is expecting the Cubs to shake off last year’s loss to little brother Milwaukee with a third division title in four years. PECOTA, on the other hand, sees the Cubs falling all the way down to the basement, driven by runs allowed per game ballooning from 3.96 last year to 4.59, as well as a slight offensive regression. Only time will tell if the Cubs star-studded pitching staff can stay healthy and bring the front office’s vision to life. The talent is certainly there, but with a tough division and uncertainty about pitching durability and depth, the Cubs will have their work cut out for them. Photo Credit: Keith Allison. Photo was slightly altered. Licensing can be found here. Kudos, Matt. Good job capturing tone of both talent and doubt surrounding Cubs. The team to beat, IMO, in 2019, with the highest overall floor of any team in the division. A bunch of the roster can turn in “meh” seasons and the Cubs could still be in the hunt. Not sure any other NL Central can pull that off. In 2021, the Cubs will still have an infield (potentially) of Bryant, Russell, Baez and Rizzo…with only Rizzo older than 29. It hasn’t proven to be a dynasty (yet? ), but the “tank-get positional cornerstones-buy the pitching when good” model of the Cubs certainly has shown better than the “collect young arms” rebuild method the Reds tried, then abandoned. 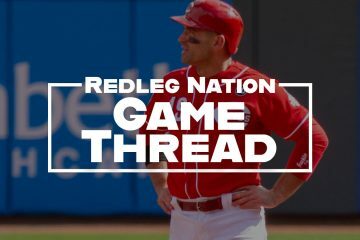 The “collect young arms” method by the Reds has been a disaster and a waste of a lot of draft choices that could have returned some really blue chip positional players. This philosophy difference from the Cubs is rooted in the Reds view of themselves as “poor little franchise in Cincinnati” that can’t afford big free agents. I think the Cubs will likely win +95 games this year, but I do look for Lester to regress more. I don’t know how the Cubs will handle it, but I would not be surprised (and expect) that sometime in June or July they make a deal to get a better starter to round out their rotation, and Lester will go somewhere else. Or else I am wrong and Lester does pitch well. Quintana will likely hover around league average. Hamels stuff I think, actually plays well at his age. He throws a sinker and change up, and while velocity is important, his control is more important. Their BIG WILDCARD is Yu Darvish. If Darvish pitches well (and he could), the Cubs will win a lot of games. If Darvish is below league average or just lousy (and it could happen), they will really struggle to maintain winning momentum from game to game. The Cubs and the Reds have the widest range of potential outcomes imo. It will be very important for the Cubs to keep their starters healthy. Can’t believe I’m saying this, but I think the Reds have the better depth in all facets. Crazy that Fangraphs and PECOTA have 9 whole games separating their predictions. Wonder what the win total over/under for the Cubs are with most sportsbooks in Vegas? Most of them have their own projection models as well as algorithms to determine what may be the perfect win-total to get that desired 50/50 betting point for each team.